Theppotsavam is the main ritual performed on Vijayadasami or Dasara during Navaratras in Kanakadurga temple, Vijayawada, Andhra Pradesh. It is the concluding event of Durga Navaratras in Durga Malleshwara Swamy Devasthanam. In 2018, Teppotsavam date is October 18. The presiding Deity of the temple, Kanakadurga Ammavasru along with Malleshwara Swamyvaru, is taken for a sail on a boat. In Telugu, Teppotsavam means ‘Boat Festival. Devi comes down from the hillock Indrakeeladri to receive the grand homage. 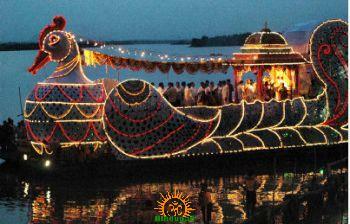 Durga Devi Utsava vigraham is taken for a procession in River Krishna on Hamsa Vahanam (Swan vehicle), swan shaped boat. The boat is decorated with flowers, carved paintings and lights. The celebration starts in the evening, mostly at 5’0 clock and ends within few hours.